This is not a recipe blog. You may sometimes wonder what kind of blog this is, but I bet you have figured out we’re not here to cook. Still, sometimes I come across amazing recipes and today I want to share two of them,by referring you to the sites where I found them. How do I find these sites, you ask? Simple. Google the name of two or three ingredients you would like to use up. This takes you to recipes that use those foods; you decide if you want to try them. Sometimes this Wild Exploration doesn’t work. The roasted sweet potato and carrot soup two weeks ago was a recipe that didn’t fledge. But these two are good and I’ve made them several times. Yes, I had bulgur in the pantry. I can’t remember why I bought it in the first place, maybe for tabouleh. Bulgur is cracked and par-boiled wheat berries - so if you are gluten-intolerant this probably won’t work for you (maybe with barley?) Bulgur is not expensive. The four main flavors in this recipe that make it so amazing are the roasted bulgur, tuna, lemon, and capers. You will see there are other flavors; garlic, onion, and whatnot. I don’t think I’ve used ALL the proper ingredients exactly as listed yet. Worse, I tend to use lemon juice from a bottle (the horror!) instead of from fresh lemons. Still tastes awesome. This is an interesting explanation of bulgur: http://sanaacooks.com/2013/02/what-do-you-know-about-bulgur-tomato-bulgur-pilaf/ Four- and five-year olds chasing crows off the roof? All the ones who don’t fall off must really enjoy this. Anyways, I don’t top this dish with the tuna, I mix it in. Fresh herbs are great. Dried will work. 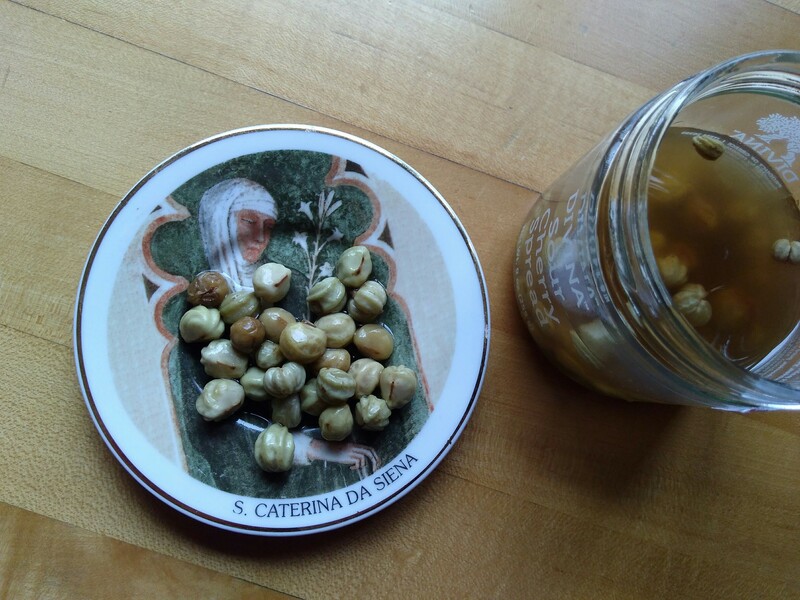 About capers. You can buy them in your grocery store capers aisle (next to the mad-cap rom-coms). OR you can save upwards of $1-3 per year by gathering nasturtium seed pods at the end of summer; put them in a jar of cider vinegar in the refrigerator. I chop the capers to get that piquant caper- flavor in every bite. I’ve been waiting for an occasion to use the word piquant. Polenta isn’t hard to make, you just need to hang out in your kitchen so you can follow the instructions and stir the cornmeal mush every two minutes. To get the polenta into the tart pan (or cookie sheet, or the bottom of a sheet cake pan); oil your fingers to simply just push, flatten, and then build up the crust edges. I’ve made this with goat cheese but also with cheaper feta; canned artichokes, parmesan out of the green canister. This stuff is elegant and also – wait for it - piquant. Sometimes the world gives us way too much high fructose corn syrup and drive-through salt and all the rest of those things that taste so good going down, but are not, in the long run, our friends. I thought I’d share possible foods that are just as addictive - which are actually healthy for us and our kids and our friends. Do you have unusually delicious, healthy, inexpensive and fancy recipes?